(Standing left to right) Board members Inks Franklin, Hilburn Fishback and Ralph Shain, University President Charles McClain, Board members William Randolph Weber, Myra Baiotto, Susan Plassmeyer and Robert Fenlon with Gov. 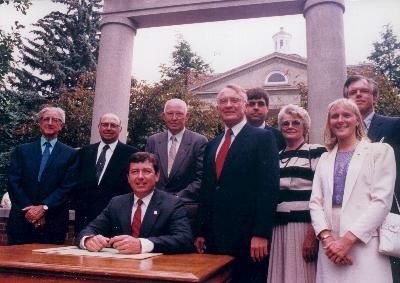 John Ashcroft (sitting) at the bill signing changing the University’s mission in June 1985. Twenty years ago on June 20, 1985, Gov. John Ashcroft signed legislation effective Jan. 1, 1986, that changed the University mission from a regional university to a statewide public liberal arts and science university. Sgt. 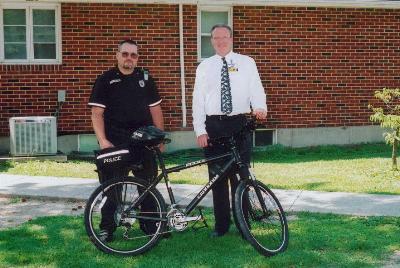 Chad Whittom and Doug Nichting, Kirksville Wal-Mart store manager, stand by the new police mountain bike Truman purchased with Wal-Mart grant funds. The Truman State University Department of Public Safety (DPS) recently received a grant from Wal-Mart to purchase a Cannondale Manitou police mountain bike and equipment from Big Shark Bicycle Company in St. Louis. DPS operates a Bike Patrol Unit as part of the department’s commitment to the concept of community policing. This unit consists of police officers who have been trained to utilize a police mountain bike as their patrol vehicle. This allows the officers to access portions of the University that have limited motor vehicle access. DPS currently has three officers assigned to the Bike Patrol Unit, but they only had two police mountain bikes prior to receiving the grant. Sara Murray, a senior health science major and women’s soccer player from Eden Prairie, Minn., was awarded the Mid-America Intercollegiate Athletics Association’s top honor bestowed on a student-athlete. She was named the women’s recipient of the Ken B. Jones Award at the conference’s annual awards banquet in Kansas City, Mo., in early June. Murray was the first Truman student-athlete to win the award since 1999-2000 and the first women’s student-athlete from Truman, in the 12 year history of the award. She was not only the first Truman female to win the award, but the first soccer player in the league’s history to be awarded the top prize. The Ken B. Jones Award has been given annually since the 1993-1994 season recognizing the top junior or senior student-athlete in the conference based on athletic accomplishments, academic accomplishments and community service. The award is named for the conference’s first full-time commissioner, who retired in 1997 and passed away last May. An 11-member panel, represented by each conference school, selects the one male and one female student-athlete. Among other awards given out at the banquet by conference commissioner Ralph McFillen, the Bulldogs received the MIAA graduation rate achievement award for being the conference school with the highest graduation rate. Truman, along with the University of Missouri-Rolla each had a graduation rate of 71 percent, 13 percent higher than the average member MIAA schools student-athlete and 18 percent higher than the NCAA Division II national average. Two Truman coaches picked up their coach of the year awards. Women’s soccer coach Mike Cannon added his sixth coach of the year award, while former volleyball coach Qi Wang picked up his third coach of the year honors. Junior high level students from across the United States recently arrived on the Truman campus for the first session of the Joseph Baldwin Academy for Eminent Young Scholars. This summer marks the 21st consecutive year that Truman has hosted the annual Joseph Baldwin Academy for Eminent Young Scholars. During the 2005 sessions in June and July, more than 400 specially selected junior high school students live in Ryle Hall and attend a focus class they have selected to pursue. The Academy is designed to enrich the learning process of gifted seventh, eighth and ninth grade students by challenging them with a college curriculum. Academy participants must be nominated by their school principal or counselor and must score in the top three percent of a nationally-normed achievement test. Two three-week sessions are offered and students choose one class from a number of different courses in each session. Each course is taught by a member of the Truman faculty. Sessions include argumentation, computers in art and design, elementary Latin, the historian as detective, chemistry, physics, world mythology, the science of secrecy, acting, astronomy, crime and justice in America, ethnomusicology, ecology, Italian language and culture, psychology, World War II and the writer’s craft. The Staff Council Spirit Committee will meet to discuss Truman’s entry in Kirksville’s All American Red, White and Blue parade. The parade will take place at 3 p.m., July 4, in downtown Kirksville. The committee will meet at 10 a.m., June 22, at Mainstreet Market. Staff members who are interested in volunteering their time or supplies for the parade entry should attend this meeting. Contact Kimberly Titus at ktitus@truman.edu if you would like to help and cannot attend this meeting. Staff Council will be sponsoring a Red Cross blood drive from 11 a.m.-4 p.m., June 27, in the Student Union Building. All donors must present identification prior to donating. The Kirksville Chamber of Commerce presents fourth of July fireworks at dusk, July 4, at the NEMO Fairgrounds. Free admission. The rain date will be July 5. The fireworks are one of many events in the All American Red, White, and Blue Festival. There also will be a parade at 3 p.m., July 4, in downtown Kirksville. Go to http://www.kirksvillechamber.com for more information. The next issue of the Truman Today will be July 5. The Truman Today is printed biweekly during the summer. Submissions for this issue are due by June 29 to kbest@truman.edu.